Traveling to the United States and in particular the State of California is considered by many to be a dream come true and no wonder. California also known as the The Golden State, is one of the most spectacular states in the whole of the United States. One of the most important reasons California is so magical is the city of San Francisco. When we think of San Francisco, we think of the famous Golden Gate Bridge. A protagonist of countless images, posters, postcards and movies. But San Francisco is so much more than a majestic bridge. San Francisco is cultural heterogeneity: it’s surfing, it’s good weather, it’s geographic beauty… And if you know how to, you can enjoy it without spending a lot of money. The Californian city is suitable for visits all year round. Of course, despite its mild and constant climate, the months of May, June, July, August and September are the most recommended for tourists. The cool and mild climate is perfect for enjoying San Francisco’s fantastic beaches and – if you are passionate about surfing – you can surround yourself with the best surfers and take advantage of the excellent waves the beaches bathed by the Pacific Ocean have to offer. So, if you decide to visit San Francisco in the spring/summer months, do not forget to apply for your ESTA authorisation in advance. This saves time and money. You will save time because the ESTA application literally takes 20 minutes to apply for and you will save money because it only costs $14. You can do this from the comfort of your own home, unlike a visa, which costs a lot more and you have to travel to the embassy for. By now you will know platforms like Airbnb, or Couchsurfing that allow renting rooms for relatively inexpensive prices compared to hotels. It depends on whether you share a room or not, you can easily find rooms for $20 per night. Stay in tourist areas. Yes, even if it sounds weird when we’re talking about saving money, it makes perfect sense when the lack of security in some areas can be expensive. Also, be sure to book in advance. In San Francisco there are many tourists and if you arrive without a reservation you can find that all the ‘good value for money’ apartments are already occupied. Downtown (Union Square) and Union Square are two of the most recommended areas to stay during your days in San Francisco. Youth Hostel Central & Hotel is a 15-minute walk from Union Square, a simple chain hostel that some will already know. If you want to save some money, avoid areas like Theatre District and South of Market. These are trendy neighbourhoods that typically surge rental prices and accommodation in high season. The subject of transport is one common things that most concern us when traveling to another country. Many of us have sinned in comfort and in the end we have been wasting our time on taxis or individual tickets when we had cheaper alternatives available. The SamTrans bus line allows you to travel around San Francisco’s neighborhoods for a modest price of $1.5. You can also leave the city across the Golden Gate for $ 3.15. Not bad, is it? The Cable Car is an icon of the city’s transportation with which you can traverse downtown San Francisco. Its price, slightly higher, $5. However, it is practically a tourist attraction because of its historical value. So really, it’s a 2-4-1 deal. The bike is also a great option to save. You can move comfortably around the city as it is adapted to it. In addition, there are several companies that rent bikes at a good price. On the other hand, you always have the cheap option of the subway, although … are you sure you want to move between the darkness and miss the magnificent views of San Francisco? Clam Chowder: This is a great creamy soup of mussels, carrots and potatoes. A delicious combination. Sourdough: It’s the traditional San Francisco bread, a super-typical and inexpensive meal. We ordered it at Boudin Bakery. 100% recommendable. San Francisco is full of possibilities and for all tastes. As always, there are some tours in which you will not need to spend money, others instead, require payments along the way. 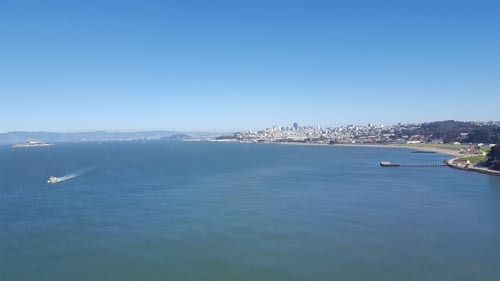 The first thing that is recommended (and this will always depend on how long you are going to be in the city) is to take a walk around its neighbourhoods, especially downtown, Fisherman’s Wharf or the hippie area of Haight Ashbury where you can find different Styles and enjoy American culture. Also, the visit to Twin Peaks hill from which you will get a panoramic view and an instant love for the city of San Francisco. On the other hand, its beaches, if you travel in summer, are an ideal destination. Ocean Beach, Crissy Field or Baker Beach are sublime and well worth the visit. The Alcatraz Prison has become a tourist destination. Despite an expensive entrance, the history that it treasures and the prisoners that were there, make this a tentative place to which to dedicate a few hours to. One of the museums I would recommend is the Legion of Honor. A museum of fine arts with an incredible facade and at a price that ranges from 10-12 US dollars. Finally, you can opt for one of the tourist packs they offer in the city like the San Francisco City Pass or San Francisco Explorer Pass. Both offer various activities and visits to different museums, attractions, etc. The first, despite being more expensive (around $75), contemplates unlimited use of trams for three days so in the end, and depending on your mode of transportation, you can turn out quite well. The second pack, on the other hand, is cheaper, but naturally has lower performance.